Will Kempe was Shakespeare's favourite fool and was destined to be one of five actor-shareholders in "The Lord Chamberlains Men" alongside Shakespeare. In February/March 1600, he undertook what he would later call his "Nine Days Wonder" by morris dancing 100 miles from London to Norwich. A 17th Century Jig, entitled Kempe's Jig, was named after him and published in the first edition of John Playford's The English Dancing Master of 1651. 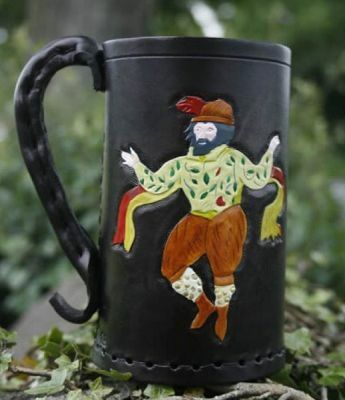 The design can be hand carved on either a Tudor Tankard or a Medieval Jack Body. Capacity of Jack or Tankard One pint - Approximately.